Christopher Priest has already given a far more eloquent appraisal of this novel than I am capable of - read his review here - but I cannot resist adding my own response. 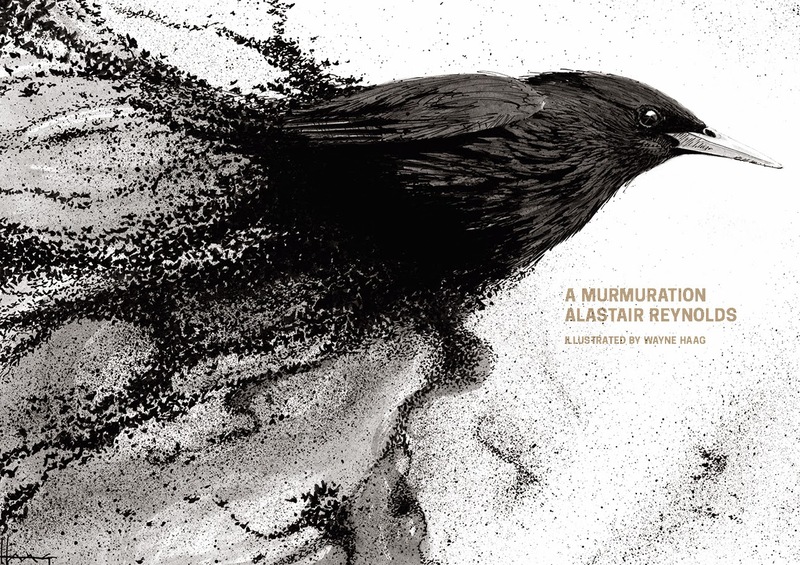 What a phenomenal book: beautiful, complex, haunting, humane, surprising at every turn, and so marvellously constructed that you hardly dare breathe. Like the best science fiction (I am not sure quite what I would call this book) it makes us see the world through fresh eyes, with a luminous new clarity. The end of air travel is a recurrent motif running through the novel: the characters are constantly looking up into the sky, remembering what it was to like to see planes, and the people born after the collapse of civilisation have no real understanding of how aircraft operated. There's a marvellous scene in which one of the older characters patiently tries to explain the purpose of runways, and that rocket ships were not the same as airliners. Later, the action converges on an airport, where the rusting forms of airliners still litter the runways and parking slots. Similarly, Emily St John Mandel's book reminds us what a privelege it is to be alive in the present day, in this time of wonders and miracles that we mostly take absolutely for granted. I published my first story in Interzone in 1990. Now it's 2015. I'm still here, and so is Interzone. Coming up in IZ 257 will be my thirteenth story for the magazine. What we call the "hut" is a couple of insulated portable cabins, with a few smaller sheds containing generators, fuel, wind turbine parts and so on. The main cabin contains a chemical toilet, a wash basin, basic cooking facilities and a set of bunk-beds. The second cabin holds our desks, computer equipment and supply stores. Two or three of us can share the hut at a time, but there is not normally a need for more than one to keep an eye on the experiment. Resources being tight, lately we tend to come out on our own. In all honesty, I prefer it this way. Birds draw out the solitude in us. They repay patience and silence - long hours of a kind of alert, anticipatory stillness. The days begin to blur into each other; weekends and weekdays becoming arbitrary distinctions. I find myself easily losing track of the calendar, birds and weather becoming my only temporal markers. I watch the migration patterns, record the nuances of altering plumage, study the changeful skies. I could not be happier. There is just one thing to spoil my contentment, but even that, I am confident, will soon be behind me. I will finish the paper. Let's have a look at the fiction in the February issue. I was pleased to see a Michael Bishop novelette as the first piece in this issue. "Rattlesnakes and Men" has a characteristically well evoked Southern setting. Wylene, Reed and their daughter Celeste, made homeless after a tornado hits their town in Arkansas, hitch a trailer to their pick-up, load up their belongings, and drive to Georgia. There's a chance of employment for Reed, following up on an old Army contact (the splendidly named Dusty Shallowpit), and the narrator of the piece - Wylene - will be able to take on various jobs including tour guide at a local wildlife refuge. So far so straightforward - we're clearly in something like the present day, at least given the evidence at hand. Things soon take a surreal turn, though. On being welcomed into their new community, Wylene's family are granted a gift they can't very easily refuse: a rattlesnake, which they're meant to keep inside their new home. In fact rattlesnakes turn out to be a very big deal in this new community, to the extent that men wear them as accessories, carry them in little holsters and so on. Pretty quickly we clue up to the fact that rattlesnakes are supplanting the role of guns, and in fact as we read on so we deduce that firearms simply do not exist in this world, and that wars and military actions still involve bows and arrows. It's a patently ludicrous set-up, but Bishop treats it with absolute conviction (the domestic rattlesnakes, which function like guard dogs, are the product of genetic engineering) and in its way no more ludicrous than rampant gun ownership in our own world. Bishop has a story to tell here, more than just presenting a funhouse reversal of our own norms, and this biting, witty, thoughtful piece, drenched in Southern summer heat, leaves us with a lot to think about. Derek Kunsken provides the second story, a clever take on generational hauntings. Brian, our protagonist, can't shake the ghost of Paolo, a dead paleobiologist who likes to whisper things like "Eumelanin is inferred to have been present in the eyes of ancient fishes by the trace metals found in fossils." Paolo is harmless - his whispering and scratching no more than a nuisance. The catch is that Paolo used to haunt Brian's aunt, and has only now latched onto her nephew. Brian's girlfriend Vanessa doesn't care for having Paolo around, though, and urges Brian to get it sorted. Ghosts, it turns out, lock onto inherited patterns in DNA, which is why Paolo is now fixated on Brian. But with that comes the possibility of exorcism via sophisticated gene therapy. Kunsken doesn't just gloss over this - he tells us how it might be done, with convincing talk of gene expression, receptors, proviruses and so on. It's a slickly written story throughout, and a fresh examination of an old trope. Reading these first two stories, the Bishop and the Kunsken, I was struck by the inherent novelty of their central premises. We often hear that there are no new ideas in SF, but what are the odds that anyone has ever written a story in which rattlesnakes take the role of guns, or in which targetted gene therapy is used to rid hauntings? SF's ideas mine is an infinitely renewable resource. We're nowhere near Peak Idea. Onto Elizabeth Bear next, with the issue's second novelette, "No Decent Patrimony". It's the first straight-down-the-line piece of extrapolative SF, being set in our world, in the future, and concerning itself with the social impacts of a radically disruptive technology, in this case life-extension technology. Structurally, it's quite a simple piece, with much less foreground action going on than you might otherwise expect for a relatively long story. The narrator, Edward, has just lost his father in a vehicle accident - we're clued in early on to suspect that the fuel-cell explosion was anything but an accident - and must now face up to life in a world no longer dominated by the presence of his immortal forebear. It turns out Edward's father was one of the early investors in the biotech firm which produced the immortality treatment, and Edward himself is now fabulously wealthy. But this is no utopia of immortality for all. The technology is strictly controlled, and since the ruling elite now get to run things for centuries, change will only happen slowly, if at all. Edward was hurt in the accident that killed his father, but after five days in hospital, he's ready to return home. Marna, the family's counsel, takes Edward back to their grand mansion in New England. When they get there, though, there's a reporter waiting for a scoop. Edward reluctantly consents to give an interview, and in the ensuing exchange we get a larger sense of this world and its background. I said that not a lot happens, but that's actually to the story's benefit, rather than its detriment. Bear takes her time to set the scene, conveying a pin-sharp evocation of this climate-disrupted future, lingering over the details of the house and its furnishings, the drowsy heat, the summer light. We wouldn't get a sense of changelessness, stasis, without this additional context. Too many SF stories devolve into little more extended dialogue exchanges, chewing over this or that social, philosophical or technological issue. While these diagrammatic exercises seem very popular when the awards come round, Bear's story reminds us that there's more than that to effective fiction. Reading this piece, I was struck by the sense - which I think has also been articulated by Gardner Dozois - that we're starting to see the emergence of what you might call the "New Default Future". Bear's world is one of vanishing privacy, information for all, continued social inequality, climate change as a given, radical lifestyle changes effected by new biotechnology. You can tweak the parameters a bit, but it does seem as if writers are once again beginning to converge on a shared sense of the future. No, it doesn't necessarily involve space colonies or rolling roads or flying cars, but it's no less valid, no less fascinating. There's a certain coldness to this piece which may be deliberate - it's hard to get really invested in anything that goes on - but there's plenty of ambition here, and the writing is never less than solid. Oddly enough, it's only the second piece of SF I can think of which treated Lamarck's ideas as valid, and both had "Legacy" in the title. "Forgiveness" by Leah Cypess is another short story, and - like "No Decent Patrimony" - it takes a good hard look at the social consequences of a plausible new biotechnology. Not life-extension, in this case, but a neural technology which enables transgressors to be returned to society, safe in the knowledge that they won't be able to commit the particular crime that got them into trouble in the first place. Anna, our narrator, is in a relationship with an abusive boyfriend, Michael, who has left bruises on her arm. Michael had just come back into her life after being treated, given a neural chip rather than jail time. Cypess's story is another of those highschool, juvenile-viewpoint pieces that I complained about last time, but in fairness, it's a nicely told piece that demands the youthfulness of its protagonists to frame the ethical issues as cleanly as it does. Michael is all contrition and repentance - but what does that mean, if the implant means he's no longer in control of his impulses? And what would Anna's forgiveness mean, in that context? What sory of forgiveness has Michael actually earned? There's nothing groundbreaking in the telling here, but it's an effective little piece nonetheless. 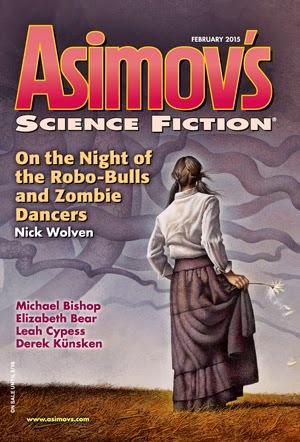 Onto the longest and last story in the issue, the novella-length "On the Night of the Robo-Bulls and Zombie Dancers", by Nick Wolven. 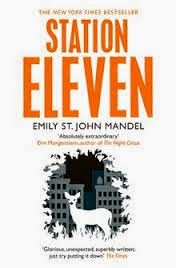 It's a terrible title, but the story itself is magnificent, one of the best I've read in quite a while. It's a kind of Conradian Heart of Darkness/Apocalypse Now-type quest to make contact with a reclusive, Colonal Kurtzian figure, one Ribbeck. The catch is that Ribbeck is a famed financial analyst, the only person who may be able to understand what sort of event the "AI quants" - the stock market's predictive supercomputers - are beginning to hint may be coming down the line. The protagonist is Gabriel Boateng, trader for Kappalytics, a firm in Downtown Manhattan. Chiding him for being late back from lunch, Gabriel's boss assigns him the task of going uptown in an attempt to get some sense out of Ribbeck. To do that, Gabriel will need to brave nighttime New York. It turns out that, quite literally, this is the City That Never Sleeps. In fact no one sleeps, ever. The biotech innovation in this society - which again plays quite nicely as a slice of the New Default Future - is a pill that banishes sleep. But I don't want to spoil the fun too much, other than to say that Gabriel's journey to Ribbeck is a tour de force of sustained, high-energy invention, and some quite phenomenal writing. At night, the streets in this area glowed with Roman-candle light. Pothole bonfires, mulitcoloured chemical torches, the lambent reflections of firelit windows, all filled Broadway from dusk to dawn with a wavering glare. In this ever-spirited sector of the city, the acolytes of libertine self-investigation had leased the dark territory of the night for experiments with personal release that year by year grew steadily weirder. Was it boredom, Gabriel wondered, the tug of the Moon, some lupercalian dream lurking in darkness itself? Wickermen on the tenement rooftops went up nightly in whuffling flame; masked figures moved through the steps of obscene dances; drugs, illegal or legal, circulated through the alleys like scurrilous words; gluttons fed to the point of purgation on street-food feasts. In the Village, promiscuity wasn't just a liberty. It was the law. All of this is merely the prelude to Gabriel's ultimate, harrowing encounter with the dementedly sane Ribbeck. This is a dark masterpiece of a story. Feeling the need for some space-based entertainment I caved in and bought the DVD of Ender's Game. 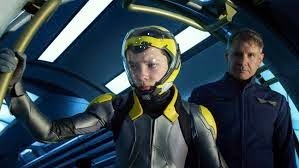 I had not seen the film when it was released, and have read neither the Orson Scott Card novel nor the original, much-praised short story from which it was expanded. That said, it is impossible to exist in the SF world and not pick up the gist of the plot by osmosis. I had also read the sequel, Speaker to the Dead, during my student years, and rather enjoyed it at the time, although I don't recall how much of the first book is recapitulated in that novel. The film is no fun at all, although like all modern SF productions, the effects are beyond reproach. But it's dull, sterile, uninvolving, digitally flat - a simulation of a simulation.There is no context for any of the characters, no sense of why Ender came to be of significance to the world government, no sense of why he got the way he is, no sense of how his sister Valentine fits into the scheme - she's just there, and then absent for most of the film, until required again for plot stuff in the final reel. When Ender is scooped up into space and sent for training exercises in a giant orbital station, there's no jeopardy, no sense of impending threat, no intimation that anything bad might happen to any of the characters. The weightless combat scenes are slow, stiff, unengaging, and even when Ender and his team of young warriors aren't rendered digitally, their skintight silver outfits and body armour make them look like unconvincingly rendered CGI mannequins. These kids have been catapulted into space and forced into a strict military command structure, so they ought to feel freaked out and terrified, but the environment is entirely too pristine for us to feel that the kids are ever in danger. It's like a fight scene staged in the ELO space station. Worse than that, though, is that the film can't resolve the major narrative thorn of the source material. Ender is being lied to - the battle simulations he's called on to direct (at least the later ones) aren't simulations at all, but realtime combat scenarios, enacted by crewed ships and drones under Ender's direct and indirect command. As SF fans, we probably know this - but the filmmakers are addressing a wider audience, and must have presumed that the majority of viewers would take the presented action at face value, as understood by Ender. That's a problem, though, because we're then faced with a film that mostly consists of kids playing computer games, except that they go up a level each time. When the big reveal happens, it's too late in the film to save the day - we've already tuned out. Worse, the additional game sequences in the film - Ender exploring a fantasy environment, which turns out to contain clues that will play a part in the resolution - look awfully crude. And we're not just watching Ender play the fantasy game - we're immersed in it, as if seeing things through Ender's eyes. An alternative strategy might have been to let the viewer in on the fact that the simulations are "real", and then play with the dramatic irony inherent in Ender's continued naivety. But other than a hint or two, that's not the way the film chooses to go, and in any case it's hard to see how telling the story from the point of view of the "adult" battle planners would have been much more successful. Fatally, when Ender does discover that he's been lied to, his reaction doesn't ring true at all. He's shocked to the core of his being by learning that he's been duped, and has just enabled the genocide of the aliens. But only a moment or two earlier, he was perfectly content to run through combat simulations using a doomsday weapon that could only ever be viewed as a direct rehearsal for exactly that genocide. So what exactly was your problem, Mr Wiggins? Later this year, a strikingly ambitious hard SF trilogy will reach its conclusion with the publication of the final volume. If I told you that the series features convincingly rendered exoplanetary locales, vast and perplexing alien artefacts, fractious political tensions between human explorers and settlers, plausibly extrapolated future technologies, a deft grasp of biology and physics, but also elegant writing, strongly evoked characters, and an immersive sense of place, then you'd probably be quite keen to get your hands on the books, as well as wondering why you haven't heard more of a buzz about them. The catch, perhaps inevitably, is that the Quantika books have not yet appeared in English, and are therefore all but invisible to the non-anglophone world. 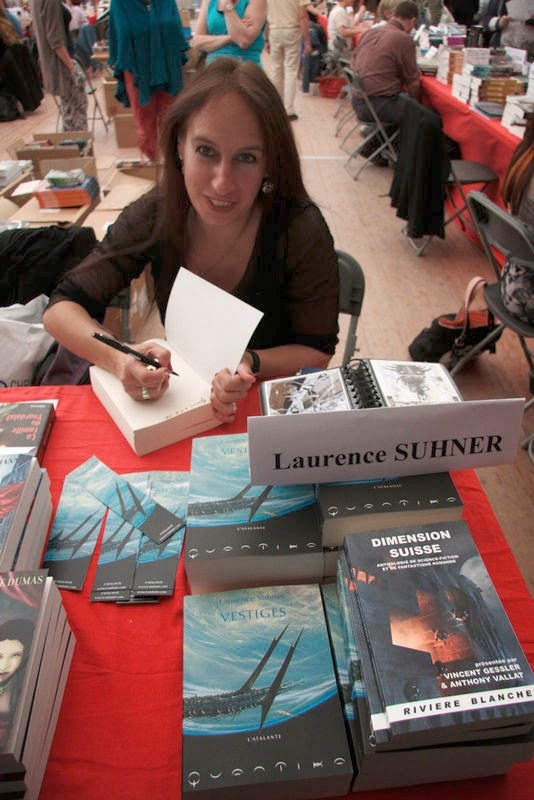 Laurence Suhner is a Swiss science fiction writer, and her books have all been published in French. She is currently finishing the third Quantika volume, Origines, and the first two - Vestiges and L'Ouvreur des Chemins - have already appeared to considerable interest and acclaim in Switzerland and France. I had the pleasure of meeting Laurence during my attendance at the Imaginales festival in Epinal, back in 2013. We were both scheduled onto a panel, held in the lecture theatre of an observatory on the outskirts of town. It was late in the day, and I was tired after a gruelling and stressful journey from London. As the panelists talked, though, I was struck by Laurence's enthusiasm and depth of knowledge across a range of topics, from biology to the latest results in exoplanet astronomy. Later in the festival we ended up signing next to each other in the main tent and agreed to keep in touch. Laurence had only published Vestiges, the first Quantika book at the time, but while my terrible French wasn't up to reading it, it was obviously the sort of thing I would otherwise enjoy. In fact, it was pretty obvious that Laurence was writing the kind of SF that would do very well in English, if only she could succeed in getting it translated. Fashions in SF come and go, but there has always been a reliable core market for big, ambitious "hard SF" - if that's not too confining a pigeonhole for these books. Later Laurence was able to send me some translated chapters from Vestiges, and I was immediately impressed, as I'd half guessed would be the case. Last summer, Laurence made plans to attend the London Worldcon, and it was a delight to meet up again and introduce her to friends in the field. More and more, though, I was struck by what an uphill struggle she faced in getting her work to a wider international audience. Few English language editors and agents are able to look at the books in their original language, but at the same time no one is realistically going to commit the expensive translation costs up-front on what is essentially an unknown quantity, especially when the books are big. It's different when a book is a break-out success in its native tongue, as can happen with some thrillers - but this is SF, and the economies of scale are different. Undaunted, though, Laurence is working to find a solution to the translation issue. In the short term, I hope to be able to read more of Vestiges. In the longer term, it would be fantastic to add this distinctive voice to the anglophone field, because I am sure Laurence would win many admirers. As Christopher Priest notes in his introduction to the third volume, "The literary and intellectual diversity (in her work) no doubt springs from the author’s varied background, which includes archaeology, Egyptology, physics, illustrator for bandes dessinées, storyboard artist, CGI design and a love of playing the tabla. An adventurous young writer like this can sometimes make her competitors feel like miniaturists ..."
Indeed. During her London trip, Laurence had brought some samples of earlier work as a graphic novel illustrator, and it was wonderfully accomplished, to the point where I was left wondering why this talented writer isn't already famous. Although I'm a little too old to enter the competition myself, I felt it would be a fun and instructive exercise to see what I could do given the same word-length constraint. I've done some vignettes before, but other than the odd SF-themed tweet, I don't think I've ever produced something quite that short. So the night before my trip down to Pencoed, I wrote an SF short story in 500 words. Actually it was 512 words, but part of my work with the students involved showing them various strategies for cutting wordage. I was keen to emphasize that the students shouldn't worry if their story looks like it's going to run over-length, as it can always be shortened once it's finished. But you have to have a finished piece to work with, before you can get down into that sort of micro-editing. I've now trimmed my piece to exactly 500 words, excluding the title. Here it is. Megan was always the first into work at the university’s computer laboratory. She grabbed a coffee from the machine in the hall, hung up her dripping coat, then settled at the workstation. She logged onto the research account, and started up the Artificial Intelligence program. A digitally-rendered face appeared on the screen. Megan eyed the camera squatting on the top of the screen. She had the feeling she was being watched by a thing with a brain. But the AI program was only software, lines of computer code. How could it know her so well? It was true; she had been running late. Megan had had enough of this. She was moving to close the program when her hand knocked the coffee over the keyboard. The computer buzzed and the screen went blank. Disturbed, Megan left the laboratory and returned to the coffee machine to get a fresh cup. But as the drinks dispenser gurgled away, she caught sight of her own reflection in its polished glass. Two eyes, looking back at her. She felt certain that she was the conscious one, not the computer in the laboratory. But could she be sure? A recent spell of clear skies had me returning to my lapsed interest in astrophotography. I've had the same telescope since about 1997 - a 9.25 inch Celestron Ultima - and while it doesn't have all the computerised bells and whistles of a modern GoTo scope, it serves me well and does everything I want it to. I don't have a dome or anything, so my scope has to live with me in my office until it's time to go and look at the stars. That means hefting the scope and tripod out in separate trips, bolting them together, and doing "polar alignment" every time I go out. As it happens, we're fortunate in that our house is lined up exactly on a North-South axis, so provided I position the scope's tripod in line with the edge of the patio or garden decking - also parallel to the house - I get close enough for my purposes. The scope's declination wedge also has to be set to the latitude where you're at, but you only need to do that once. 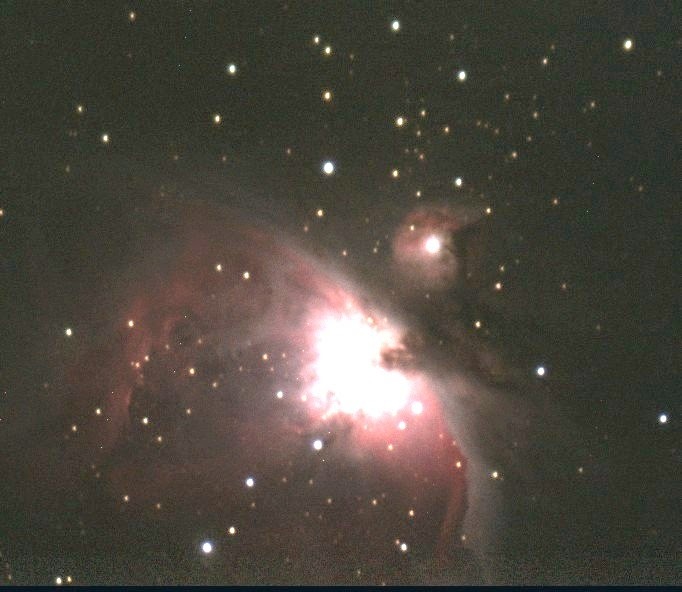 Here's one of them - M42 or the famous great nebula in Orion. If you've ever looked at Orion on a dark winter's night, this is the fuzzy bit in the sword, easily visible with the naked eye. It's also one of the easiest targets for astrophotography but also one of the most visually striking, and I had to start somewhere. I achieved this image after a couple of nights' experimentation with different gain and exposure settings, and it's the result of merging three separate five minute exposures. What you're looking at is a star-forming region about 1350 light years away, so the photons that crossed space, went through the optics of my telescope, and finally interacted with the detectors in the camera, producing a stream of electrons which were finally converted into digital signals on my laptop, left on their journey around 665 AD... which according to Wikipedia was around the time Wilfrid, the Anglo-Saxon abbot, refused to be consecrated in Northumbria as bishop.